Home > Shop By Brand > BLACKFIRE Pro Detailers Choice Car Care Products > BLACKFIRE Multi-Surface Dressing Concentrate 32 oz. Ultra-concentrated formula gives you more product for less! What’s the number one goal in auto detailing? Creating a perfect shine. Whether that’s from hours of paint correction or multiple layers of your favorite wax, creating a mirror finish is the goal – and that applies to all areas of the vehicle. While your exterior plastic pieces will never really “shine” like freshly waxed paint, you can create a perfectly detailed look, especially when BLACKFIRE Multi-Surface Dressing Concentrate is used! BLACKFIRE Multi-Surface Dressing Concentrate was designed to be the “people’s dressing”. 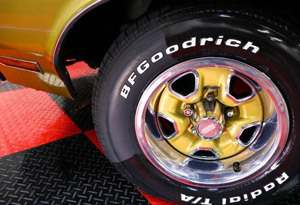 The versatility of this formula allows you to create the exact finish you want on your treated surfaces – be it that “wet” look on tires, or a more muted, satin finish on your exterior trim. For professional detailers, BLACKFIRE Multi-Surface Dressing Concentrate allows you to stretch one bottle of product further, without compromising a freshly detailed look. In this 40/60 shot, you can see the portion of the tire that hasn't yet been treated looking dull, while the remainder of the tire shines from just one layer of BLACKFIRE Multi-Surface Dressing Concentrate at 1:1 dilution. After buffing, the entire tire is left looking freshly detailed! In addition to delivering your desired layer of gloss, BLACKFIRE Multi-Surface Dressing Concentrate provides protection against UV rays, dirt, dust, and more and will make the removal of said contaminants easier. 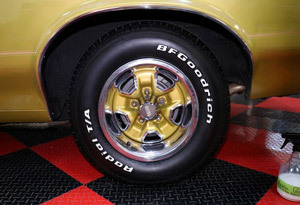 When used on leather surfaces, BLACKFIRE Multi-Surface Dressing isn’t too slick that you or your customers will be sliding around, and neither does it sling when used on tires. Thanks to BLACKFIRE Multi-Surface Dressing Concentrate’s versatile formula, you don’t need multiple bottles of dressings for each surface – use BLACKFIRE Multi-Surface Dressing Concentrate on both interior and exterior leather, plastic, rubber, and vinyl! Keep both your wallet and your car happy with BLACKFIRE Multi-Surface Dressing Concentrate! For a high gloss finish, dilute BLACKFIRE Multi-Surface Dressing Concentrate 1:1. For a low shine, satin finish, dilute BLACKFIRE Multi-Surface Dressing Concentrate 1:2 or 1:4, depending on your preferences. • Spray BLACKFIRE Multi-Surface Dressing Concentrate directly onto the surface to be treated. • Allow time to penetrate before buffing excess product away. • Multiple layers can be used for an increased shine. BLACKFIRE Multi-Surface dressing safe for use around painted areas. What can I say? It works! Detailed my work truck that was full of food crumbs LOL, dirt and grim and now my truck looks rejuvenated. It looks as it did when I drove it home the first day and it's a 2017! I'd like to add that I used (16 oz.) McKee's 27 Hi-Intensity APC Plus to clean the entire inside first. You can't go wrong with this product! I really love this surface dressing, it works great on tires, and trim. I found out it works great on my ATV plastic body and I love the fact you mix it as strong as you like I don't like my tires to have to much of a shine. I found the more you use it the easier it is to keep tires and trim clean. Easy to prepare and use and leaves an amazing shine.